The North Bay Community Concert Association was a volunteer organization which organized regular concert series of professional live music in North Bay. Founded in 1943, the Association was one of many such community concert associations in Canada and the US which organized concerts through a partnership with the New York-based booking agency Columbia Artists Management Incorporated and its subsidiaries. Community concert associations would hold annual membership campaigns, requiring members to purchase prepaid subscriptions to the year’s concerts. With the funds raised, the associations would rent a concert venue and book artists through Columbia Artists Management Incorporated, which was responsible for making all other concert arrangements and for providing pre-printed concert programs and publicity material. This “organized audience” program allowed volunteer groups in smaller cities and towns to engage major Canadian and international artists for local concerts which would not otherwise have been financially viable. The North Bay Community Concert Association usually sponsored four members-only concerts each year, predominantly featuring classical music, but occasionally folk music, musical theatre, and dance. Some of the more well-known artists who performed in North Bay included the Von Trapp Family Singers, de Paur’s Infantry Chorus, the baritone Todd Duncan, contralto Portia White, soprano Camilla Williams, and pianist Lillian Kallir. Local musicians were only rarely featured. At its peak in the 1960s and 1970s, the Association had between 1000 and 1500 members. Concerts were held in the auditorium of North Bay Collegiate Institute and Vocational School (later renamed Algonquin Composite) until 1959, when they were moved to the Capitol Theatre. In 1980, the Theatre’s owner cancelled their agreement with the Association, forcing it to move the concerts to the auditorium of West Ferris Secondary School, which did not prove adequate. Faced with a lack of a proper venue together with a dwindling membership, the Association voted to disband on 10 September 1984. Records were in the custody of Doris Stanley, the former President and head of publicity for the North Bay Community Concert Association, presumably from the time of the Association's disbanding in 1984 until its donation to Nipissing University's Institute for Community Studies and Oral History (ICSOH) on January 11, 2007 (ICSOH accession # 2007/1). In 2015, they were transferred to the Archives by Francoise Noël on behalf of the then-defunct ICSOH. Fonds reflects the North Bay Community Concert Association's organization and sponsorship of musical concert series in North Bay, and also contains records pertaining to the Association's governance and administration. Records span the entirety of the Association's existence from 1943 to 1984, and slightly beyond it. Records are arranged into three series based on function or documentary type. Textual records in the fonds consist of annual reports, by-laws, membership lists, concert programs, promotional material, correspondence (primarily with booking agencies, grants agencies, and local community groups), meeting minutes, scrapbooks, and newspaper clippings about concerts and events. The fonds also contains promotional photographs and other publicity material regarding concert performers, which was provided by the booking agency. Materials transferred by Francoise Noel in 2015 on behalf of the Institute for Community Studies and Oral History (ICSOH). 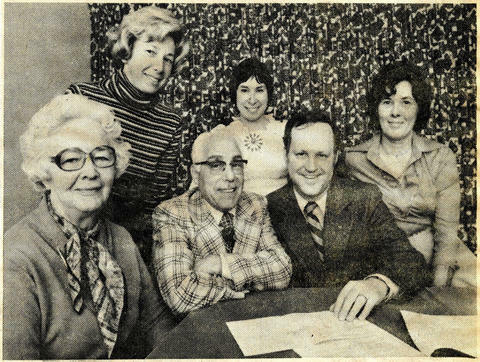 The image linked to this description (NBCCA.jpg) is a group portrait of the executive of the North Bay Community Concert Association in March 1978. The photograph is from a <i>North Bay Nugget</i> newspaper clipping dated March 13, 1978, which is in Scrapbook 4 (<a href="http://archives.eclibrary.ca/scrapbook-4" target="_blank">Item 0068-04</a>). The caption reads, "Gallardi leads concert association - North Bay Community Concert Association activity will be directed with Jim Gallardi as its president. The executive was chosen at the annual meeting Monday night at the Empire Hotel. Front row from left is: Mrs. J. A. Clipsham, first vice-president; Mr. Gallardi and Neil Cornthwaite, second vice-president; Back row from left are: Maryanne Gomm, campaign chairman; Ines Backlund, membership secretary; and Mrs. W. H. Stanley, past president. -Nugget Staff Photo."